After the unexpected death of her father, Miss Sylvia Burnett visits her friend who resides in the same area where her father’s mentee, Bruce Miller, set up practice. With a calf-love on her part, Sylvia and Bruce once agreed to wed each other if she remained unattached to a certain age. But are youthful promises meant to be kept? Will the handsome physician want her now? Dr. Bruce Miller has watched all his friends marry and begin their families, but village life has not provided him with a wife. When a letter from the daughter of the doctor with whom he interned arrives at his door, hope soars within that maybe this woman is the answer to his lonely nights. 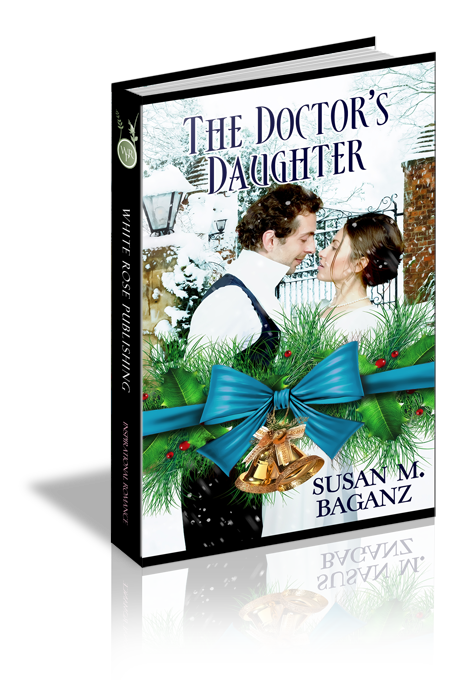 As influenza spreads and Sylvia uses her talents in medicine to aid the doctor, will he find her competition or a viable companion? With Christmas dawning, will dreams be shattered or fulfilled? Silvia paced as she packed up the remainder of her father’s practice. His death had been sudden, and while she possessed some knowledge of medicine, she was incapable of filling the big shoes he’d left. The brisk November air sent a chill through her. She’d sold off most of his belongings but kept some of the older books on natural medicine. Although her father scoffed at some of the remedies, she’d found that many did work as she’d labored alongside him all these years. She was out of time in this cottage. She needed to leave. Not only was the house no longer hers, but Sir McElroy’s harassment had increased. The sooner she escaped his notice, the better, for she feared he would be ruthless in seeking to claim what he thought was his. She would never wed one such as he. His puffed-up consequence led him to believe that his station as a minor baronet meant she was his for the asking. Her father always told her to follow God and listen to her heart. Her heart warned her that the baronet was dangerous, so she’d poured out her troubles in a letter to her friend Katrina. Her friend offered her refuge and the position as a nursemaid in their household, should she want it. The work was not beneath her, but she longed for a family of her own. The only man she could envision that with was Bruce, who years ago studied with her father. The late Dr. Burnett had held a deep respect for the younger man. The remembrance of the doctor who had swept her off her feet years ago, surprised her. Dr. Bruce Miller lived close to Katrina. Would Silvia see him again? Would he remember her? Would the attraction which had blossomed between them still be there? Recently, she’d gone beyond the pale and written to him, practically begging him to marry her based on a long-ago promise. Why hadn’t he returned to court her when she’d come of age? She shook her head at her foolishness. How could he? He had patients to care for and doctors didn’t have the freedom to go on holiday at a whim’s discretion. Besides, her too-forward missive had probably put him off. She shoved the last item into her crate and motioned for the servant to carry it out to the carriage. She was grateful that her friend sent one for her, insisting that she travel in comfort instead of on the stage. “Are you ready Miss Burnett?” Sir Michael Tidley stepped inside and surveyed the empty room. She hadn’t expected Katrina to send her husband to fetch her. Silvia grinned. Katrina had nabbed a good man with a quick wit. Silvia suspected her lamentations over Sir McElroy had caused her friend to take this precaution lest Silvia be detained by nefarious means. My, wasn’t Katrina becoming dramatic? Silvia grabbed her cloak and hat and headed for the door taking one last glanced around. This had been home for her entire life. She sighed. Adventure awaited, and if her prayers were answered, maybe even love. He closed the door after she exited and rushed to open the carriage door for her. She groaned. Not him. Not now. She glanced at Sir Tidley. “Is that the man?” he whispered. Nodding she turned to face her erstwhile suitor. “Sir McElroy. I must hasten away.” She put a foot on the first step to the carriage and Sir Tidley moved around to block most of her view and assist her. His cheeky grin reassured her that he was up to the task of helping rid her of this man. “You cannot leave.” The baronet posed with one fist on his hip and another holding a monocle to his eye, an affectation that frustrated her no end. “I can, and I must.” She took another step up and Michael handed her into the carriage, closing the door behind her. McElroy’s jaw dropped as did his monocle, falling into the dirt. He bent to search for it as Sir Tidley jumped up to take the reins of the horses. “Good bye!” As she waved, the horses jerked the carriage forward against the weight of all the luggage it carried. “No!” McElroy stepped forward landing on the eyeglass and was so distracted by having ruined his pet object that he never spared her another glance. Silvia settled back against the squabs, closed her eyes, and thanked God for His provision in time of need. Now if she could only overcome her anxiety as the unknown future loomed before her. For now, she had a place to be where she could be useful, but it wasn’t a long-term solution. She sure hoped Bruce hadn’t developed a tendre for any of the local women. She’d been afraid to ask Katrina about that.